We have been enjoying meeting people at the Washington State Fair for the last two weeks. Last Saturday was a particularly hot day and attendance was at a maximum. As you can imagine, our booth, with its constantly blowing air conditioning, was a huge hit! People would just sidle on in to the booth for about a minute and bask in the cooling breeze. Many people were surprised to learn that a ductless system is NOT the same as a portable air conditioner or heater. Given that there is no ductwork involved with a ductless system, and the indoor heads are small, it’s easy to see how someone might be confused. But a ductless system isvery different. First of all, ductless systems are permanent. A ductless system is a hard-wired, installed system that provides both heating and air conditioning. It is comprised of two main components: The outdoor unit and the indoor unit. The outdoor unit sits on a cement slab and the indoor unit is mounted to a wall, floor or installed in the ceiling. The outdoor and indoor units are connected by copper tubing that delivers refrigerant combined with power cables and a condensation drain. 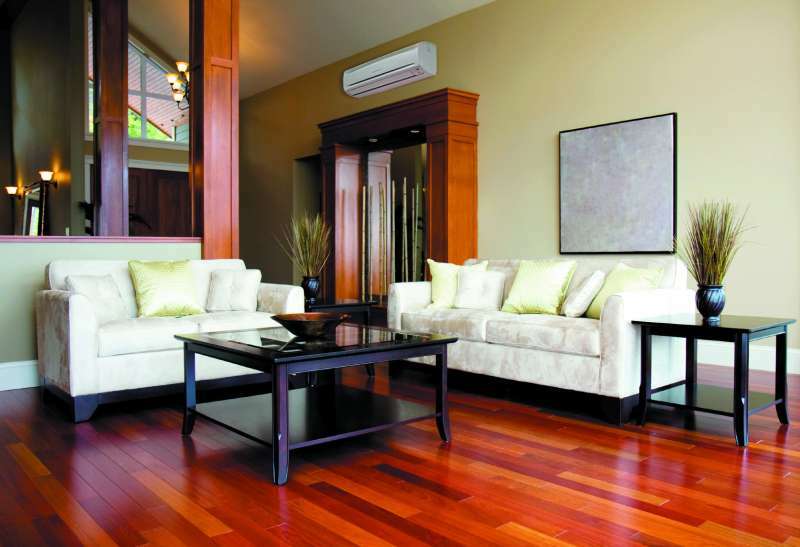 Second, ductless systems provide both heating and air conditioning. This is because they use reversible, two-way pumps that transfer heat between the indoor and outdoor air. Refrigerant vapor is compressed and heat is collected from the outside to be delivered to the inside during the heating cycle. The compressors are variable speed, and use inverter technology, meaning that they switch from AC to DC. This means that they continuously work to match the heating load, avoiding the need to cycle on and off. It is the cycling on and off of conventional heaters that causes the discomfort of uneven heat. With ductless, the comfort is constant! And, with reversible pumps, the system switches from heating mode to air conditioning mode with the click of a remote. Two systems in one! Finally, unlike portable systems, ductless heat pumps are quiet. All of the noise (around 52 decibels) comes from the outdoor unit; the indoor unit contains evaporator coils and a quiet oscillating fan. No clicking, no roaring, no on-and-off...just a soft, continuous purr. The icing on the cake? Ductless heat pumps do this at an operating cost that is about 25 to 50 percent less than conventional space heaters/air conditioners, or central, forced air systems.